The Dark-eyed Junco, formerly known as the Slate-colored Junco and commonly called a snowbird, is found across Tennessee in the winter and breeds in the mountains of East Tennessee. In fact at higher elevations, it can be the most conspicuous and abundant nesting bird. Juncos are familiar to most Tennesseans because they are easily identified, relatively tame, forage in flocks on the ground, and visit bird feeders. Their summer range extends across Alaska and Canada, southward to southern California and northern Georgia. The winter range extends from southern Canada across the United States to northern Mexico. Over most of Tennessee, Dark-eyed Juncos are present only from early October to mid-April. Description: The Dark-eyed Junco is gray above and white below, with white outer tail-feathers, a dark eye, and a pink bill. Males and females are similar, but females average paler and browner. Juveniles (May-August) are similar to adults, but have fine streaking on the chest, head, and back. Voice: The song is an even musical trill lasting about 2 seconds. Calls include a short, hard tsip, and excited high-pitched twitters. No other sparrow is so plainly marked gray or gray-brown with white outer tail feathers. Habitat: Dark-eyed Juncos breed in coniferous and mixed forests, and on grassy balds. They winter in fields, suburbs, edges of parks, around farms, and along rural roadsides and stream edges. Nesting and reproduction: In Tennessee, males begin returning to breeding territories in late March, and the start of egg laying is influenced by elevation and spring temperatures. Juncos will raise 2 to 3 broods during the breeding season. Clutch Size: Usually 4 eggs, with a range of 3 to 5 eggs. Incubation: The female incubates the eggs for 12 to 13 days. Fledging: Both adults feed the young, which leave the nest between 11 and 14 days after hatching. Nest: The female usually builds the open cup-nest in a depression on the ground or a sloping bank, well hidden by vegetation. The nest is constructed of grasses, moss, and rootlets, and lined with finer material. 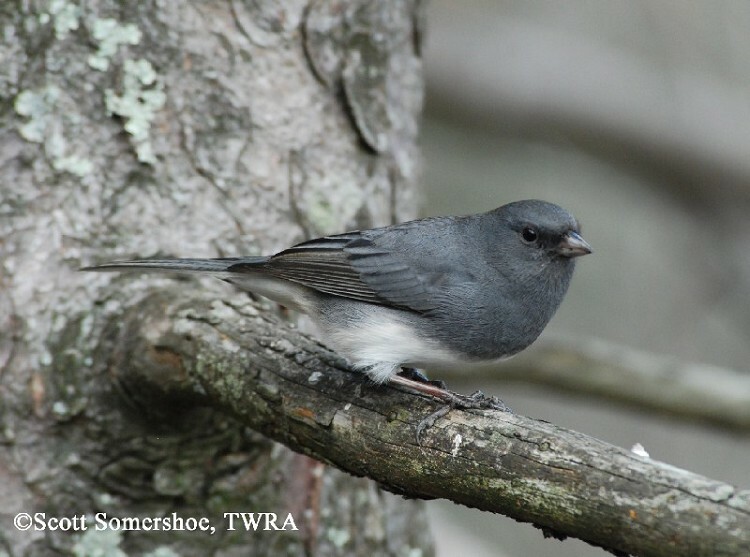 Status in Tennessee: The Dark-eyed Junco is a common migrant and winter resident across the state arriving by early October and departing by mid-April. It is a common breeder and year round resident in the mountains of East Tennessee, especially above 4,000 feet. Dark-eyed Juncos breed across virtually all of North America, and junco populations differ in plumage and bill color, migratory behavior, and body size across that range. Until the 1970s, these different looking populations were split into 5 distinct species: the Slate-colored, White-winged, Oregon, Gray-headed, and Guadalupe Junco. Not all taxonomists agree with the American Ornithologists' Union's new classification. Dark-eyed Juncos breeding in the Appalachian Mountains have shorter wings than the migrants that join them each winter. Longer wings help the migrants fly long distances. The oldest known Dark-eyed Junco in the wild was 11 years 4 months old. Best places to see in Tennessee: Dark-eyed Juncos can be found statewide during the winter. In East Tennessee, year round residents can be found in Great Smoky Mountains National Park, Carver's Gap on Roan Mountain, Cherokee National Forest, and other mountains, especially above 4,000 feet. Nolan, Jr., V., E. D. Ketterson, D. A. Cristol, C. M. Rogers, E. D. Clotfelter, R. C. Titus, S. J. Schoech and E. Snajdr. 2002. Dark-eyed Junco (Junco hyemalis), The Birds of North America, No. 716 (A. Poole and F. Gill, eds.). The Academy of Natural Sciences, Philadelphia, PA, and The American Ornithologists' Union, Washington, D.C.